Millions, if not billions, of people around the world start (and often continue) their days with a hot, stimulating beverage. And despite the popularity of yerba mate in Argentina and its neighbors, for most people the pick-me-up of choice is coffee or tea. But, as economic geographers and market analysts have long known, most countries show a distinct preference for one or the other — a legacy of geopolitics, colonial expansion and shifting trade patterns. This map from The Economist (aggregating data on 79 countries from market-research firm Euromonitor International) clearly delineates the coffee and tea blocs. Coffee predominates in the Americas and in continental Europe, while tea is preferred in most of Asia and the former Soviet Union. 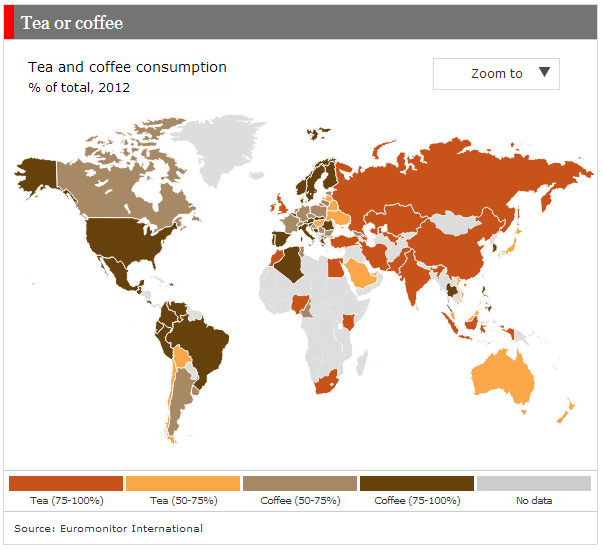 On the interactive map [click through above], mousing over each country shows the relative preferences for coffee and tea. In the U.S., for instance, people drink three times as much coffee as tea; in Russian the ratio is almost exactly reversed. As Stanford University geographer Martin W. Lewis notes on his GeoCurrents blog, the geography of hot drinks has changed markedly over the centuries. Places once so famous for coffee that they gave their names to it (Java, Turkey, the Arabian peninsula) now favor tea or other stimulants, as do most of the tropical countries that grow the world’s joe (with a few exceptions, such as Colombia and Brazil). Great Britain exported its love of tea to most of its former colonial dominions, and it’s no coincidence that South Korea and the Philippines — both with close ties to the U.S. — are among the few Asian nations to prefer coffee over tea.